Just by virtue of the fact that it’s about MOSS 2007, this is a seriously retro post, but I had to do this just last week, so I figured I’d share it. Also, there’s always been talk about the idea of the Fab 40 templates being released for SharePoint 2010. Of course, in 2010, there are other ways to deploy templates. For example, you can go to the Solutions Gallery and click Upload Solution. But for those of you lucky enough to have only done it that way, here’s a look back in time. 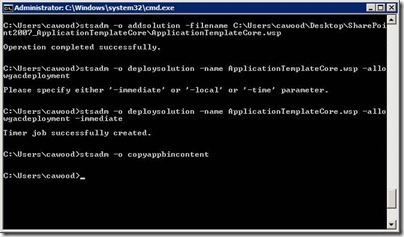 First install Windows SharePoint Services 3.0 Application Template: Application Template Core. To do this, use the stsadm command line addsolution. Then follow the same steps for the Bug Database solution. 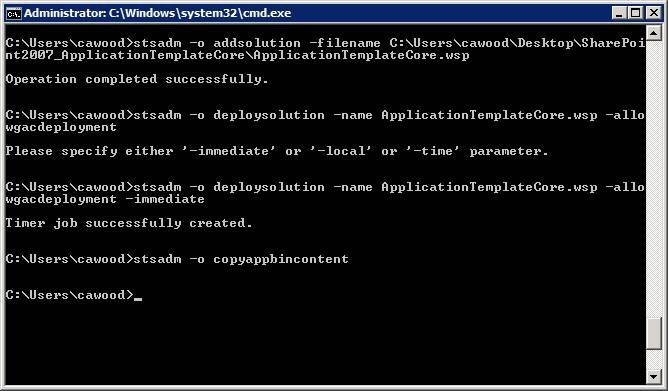 After the solution is added, you need to use the deploysolution command to deploy it. The –immediate flag is used to deploy it right away. To check the deployment status, browse to the SharePoint Central Administration site. 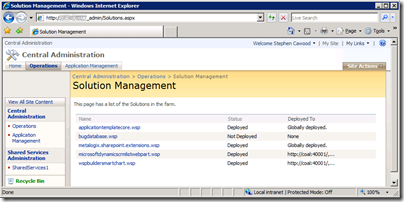 Click the Operations tab, and then click Solution management under global configuration. After all the solutions are marked Globally Deployed, run iisreset from the command line and you’re done!